View our Calendar of Events for the most up to date schedule. Events may be added at a later date. A Guide to the Behavior of Foresters in Public Office. 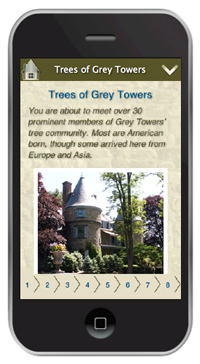 The Grey Towers brochure contains a general overview of the site and its history. The Forestry Trail brochure provides detailed information of forestry related activities available along the trail. The Landscape Tour brochure provides an overview of prominent features on the grounds. Trees of Grey Towers brochure provides botanical and historical information on about 30 of our most prominent or interesting trees. Or, while strolling the grounds on your own, you can read the identification placards with QR codes for your mobile device in front of each tree. The Walking Tour brochure lists of 15 historical sites within the Boro of Milford. Starting at the intersection of Broad and Hartford Streets.